The article below was published in Squash Magazine, after I saw her professional debut last summer…. A woman I knew from my gym was making her professional debut and I’d never seen her in action. I had seen her plenty of times at the gym; she was a personal trainer and always had a friendly smile for everyone. But on the night of her match, when she approached her opponent, her smile was nowhere to be seen. In fact, her visage was so severe, I barely recognized her. The two women locked eyes, the bell rang, and within seconds Jennifer Santiago, threw her first punch. I had never seen a live boxing match before. The mostly male, bare-chested world of boxing seemed about as far as one could get from the ‘white clothing only’ private club contingent of squash that I’d come to know. 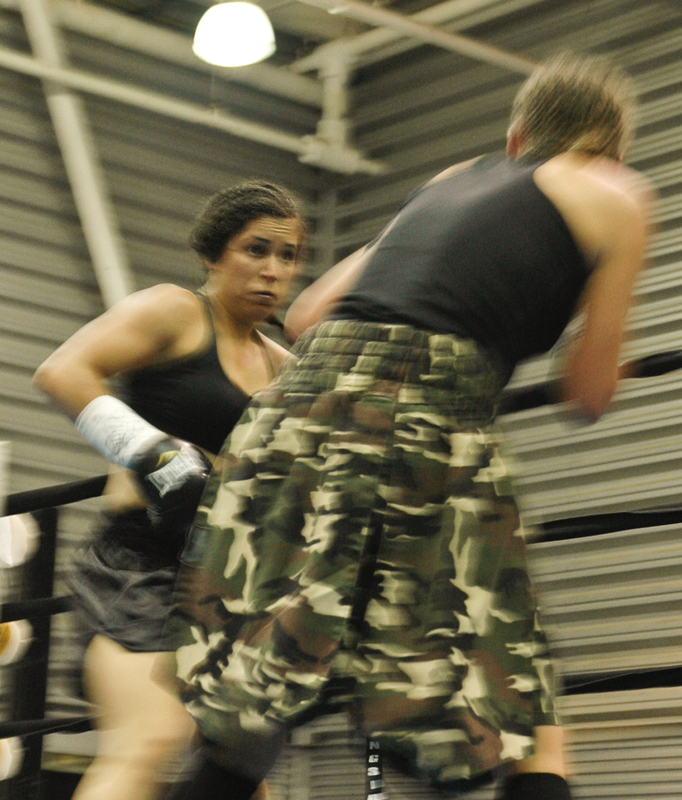 But when a friend mentioned that Ms. Santiago, a two-time Golden Gloves Champion, had an upcoming fight, I was intrigued. Motivating women to hit a ball instead of hitting an exercise class is often hard enough, but getting a woman to hit another woman? I wanted to see it with my own eyes . . . and maybe I’d learn something to help my squash game. Admittedly, I felt somewhat anxious as the date got closer. Would the sight and sound of fists driving into flesh, bones potentially crunching, blood possibly spurting, make me want to turn and run? I had occasionally slugged my kid brother growing up, but the squash ball has long replaced him as the object of my aggression. Not to mention, there’s more than a whiff of violence and illicit thrill to the sport of boxing. Cheering for one person to hurt another seems both wrong and exhilarating. Even if I didn’t mind the violence, I wasn’t sure if I’d like myself liking it ….but I was getting way ahead of myself. Being within a few feet of an intense athletic competition is a thrill (even if you do have to dodge the spraying sweat), and one that a squash match can’t quite replicate, since there’s always a wall of glass between the audience and the action. When the guys came out for the first round bout (the women were fourth in the line-up), I hid behind my camera; it gave me something to focus on besides the thunk of leather meeting muscle. But the more I watched, the more my camera dropped from my eye and the more I became intrigued by who was dominating and how they were doing so. By the time, the women appeared, I was thoroughly engrossed. There are a lot of similarities between squash and boxing. Fast feet and even faster reflexes. Not to mention, incredible stamina; Rocky didn’t run up the steps of the Philadelphia Museum of Art for nothing. And both are games in which your aim is get your opponent out of position and back on their heels. But of most evident importance—which Hashim Khan calls “Keep eye on [eye] ball”—was the victor’s focus. Not only did Jennifer never take her eyes off her opponent, she never eased her gaze; it flamed with intensity. The look not only showed how strong she was, that her fuel gauge was still close to full, it said “I am better than you. More prepared than you. And will last longer than you. There is no hope for you.” I may begin practicing that look for my squash matches. It was refreshing to see women looking so fierce for a change. Intimidation is an accepted part of boxing and if you want to win, you better show that you not only can but you will. I often think that women would benefit from using and getting used to intimidation. At the higher levels of squash, it seems to already exist. After watching some pro level women play last year in the US Open, I asked one of the players how she felt about her opponent’s numerous requests for lets and pugnacious demeanor. “Oh,” she replied, “you get used to that as a Junior. It didn’t bother me.” Fair enough. I’m not advocating or condoning bad behavior, but winning is serious business and when your face and nose and gut is at stake, you’re going to use everything you have to keep the upper hand, whether it’s getting in your opponent’s face or making sure they stay out of yours. Even with my quickly gleaned insights on winning, I still wasn’t totally sure who actually was doing so. Jennifer was clearly the dominant aggressor, leading the dance around the ring. I’m sure that there was skillful logic to the flurry of jabs and crosses and feints, but mostly I saw two women punching and ducking as if their lives depended on it. As with any sport, the more you watch, the more its actions reveal their secrets; I was still a novice. What was crystal clear, however, is that I would’ve been knocked out within the first sixty seconds. I wouldn’t want to enter that ring without a lot of training; the consequences were more ominous than on a squash court. Or were they? Most of my non-squash playing friends think I’m nuts to get in an enclosed room with another person, wield two lethally hard objects, and then whip them around next to each other. We may wear eye protection, but there’s no mouth guard, and a racquet’s a lot more destructive than a couple of padded mitts! Squash players are perhaps braver than I thought . . . but than I recalled a single moment last fall. Playing a game of hardball doubles with some friends, I watched dumbly as one of my opponents followed the ball around the back wall, wound up her forehand, and let the ball fly off of her racquet . . . straight into my neck, and so hard it left a long red skid mark that lasted for weeks. I barely lasted a second on the court, the equivalence of a knock-out. Clearly, I needed more practice, as well as more guts. I eventually got back on the doubles court, but the jury’s out on whether I’ll ever have what it takes to get in a boxing ring, much less lace on some gloves. But would I like to go back, lean on the big blue mat, and watch the victorious Ms. Santiago knock someone flat? The thrill-seeker in me says yes. Fascinating, Tracy, and I agree with the parallels you draw between boxing and squash. A great feature of squash is how welcome you are among squash people, anywhere, any time. Maybe this follows the intense physicality of the contest. You often see boxers who have been slugging the heck out of each other embrace like long lost brothers (or now maybe sisters!) at the end of a contest. We try to knock the physical heck out of our opponents on the squash court too, within the confines of the sport. I reckon this fosters the strong fraternity to be found throughout the squash world.